Radviliskis’ State Public Library was established on 15th March, 1937. The first manager of the library was Juozas Paskevicius. In 1974, the Public Library was transferred to new premises at 9 “S. Dariaus ir S. Girėno” St. In 1976, all the district’s libraries were centralized. The Public Library became a central library with 46 rural and 2 urban branches. The District’s Children’s Library was reorganized and became The Children’s Literature Department of the Central Library. Since 1986, the library has been led by director Aldona Januseviciene. In 1995, the Central Library was renamed into the Public Library. In 1997, the library’s Play Area was opened for children and families. 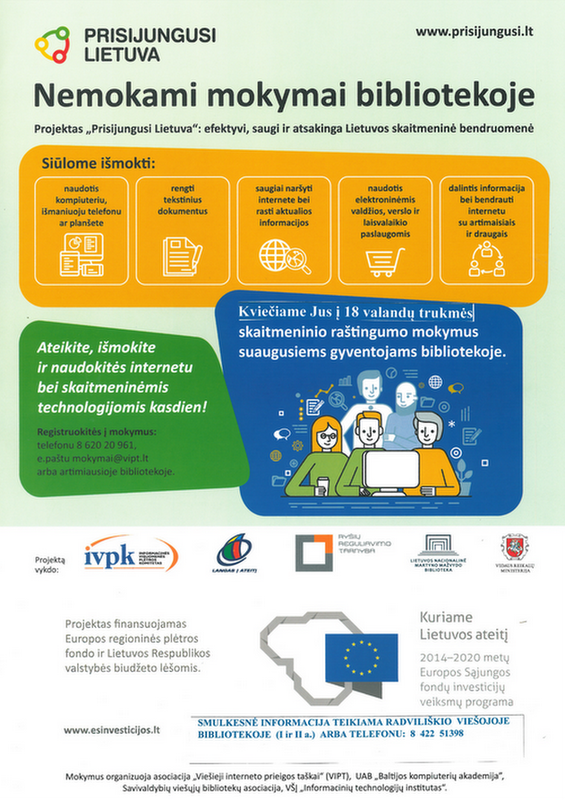 In 1997, Radviliskis’ branch of The Lithuanian Librarians’ Association was founded. In 2001, LIBIS (Lithuanian Integral Library Information System) computer programme was introduced in the library. In 2005, LIBIS Readers Service sub-system was introduced. In November 2006, a renovated and modern Public Library opened its doors to the people of Radviliskis. In 2010, Radviliskis district’s centralized library system comprised: the Public Library, Seduva branch, and 24 rural branches.